The Law School Council elections are under way but questions remain about the facilitation by the SRC. ELECTIONS for the Law School Council (LSC) are taking place today, Tuesday, April 24, and students studying law have until 23h59 to make their voices heard by electing 13 representatives through an online voting process. The circus* for the elections was held on Monday, and each of the five parties taking part – The Litigants, Vero, Ladies of Liberty, Invictus and Amicus Curiae – did their best to convince the 50 or so students and staff of the Law School that had turned up that they alone had the answers. However, the circus was overshadowed by a controversy surrounding the role of the Wits Student Representative Council (SRC) in the LSC elections. Outgoing LSC chairperson Mpendulo Mfeka told Wits Vuvuzela that the SRC had announced in March that, for the first time in LSC elections history, it would facilitate the elections. However, Mfeka said the SRC had not followed through on this mandate and was not present at the circus. SRC president Ordirestse Masebe denied these accusations, saying, “The SRC oversees the election process of every student council. Previous SRCs have done the same in the past. As will happen even in the future. All school council elections are under the auspices of the SRC. It is not by choice, but a matter of constitutional obligation. Mfeka’s understanding of the SRC’s role seemed to be shared by the different parties that were campaigning at the circus. Ishaaq Sader, a second-year BCom student and member of The Litigants party, told Wits Vuvuzela that the LSC elections were six weeks late, as a result. “If you’re going to take over, take over properly. There has been a lot of miscommunication from the SRC,” said postgraduate LLB student and member of the Ladies of Liberty party, Gomolemo Tau. Although many did not agree with the SRC facilitating the election, some could see the benefits of having the SRC involved. Katlego Sokopo, a BA Law student and member of the Invictus party, told Wits Vuvuzela that, “The new process that the SRC introduced has its benefits and its flaws.” He explained that, in previous years, candidates could run for the LSC without being endorsed by students. With the SRC taking over, “Candidates have to be endorsed by fellow students, meaning they need to get 15 signatures. I like that because people are no longer running for the sake of running, and this process sorts out the people who are serious about campaigning,” Sokopo said. The results of the elections of LSC 2018/19 will be announced on Wednesday, April 25. *The circus involves a discussion from all parties and candidates who are running for council. Each party has a chance to speak for 10 minutes, promote what it stands for as well as what it hopes to achieve if elected. Each session ends with questions and answers. 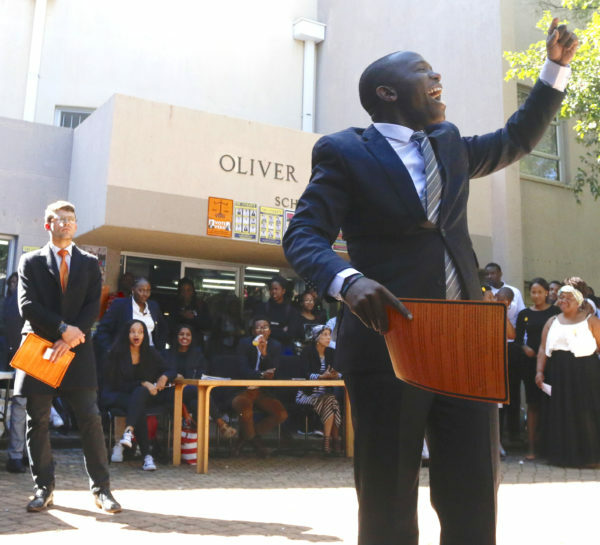 Wits Vuvuzela, Former law school head contests dismissal, March 2018.